Giving a pledge of allegiance using one's voice to speak the words into vibration is a very powerful tool for manifestation. In law, speaking our mind via the word is known as a testament, using our free will, the most powerful thing in the universe. A pledge is defined as a solemn promise, vow or undertaking, and in a contractual capacity, it is a thing that is given as security for the fulfillment of a contract or the payment of a debt and is liable to forfeiture in the event of failure. Both definitions are applicable here, but given that a person's ability to understand what they are pledging to is of prime importance, how binding can this promise actually be? As children, we are told that it is required of us to pledge allegiance to "our flag, and the nation for which it stands," but all of these are admiralty law conventions for vessels at sea, for dead things in the corporate world of commerce. By pledging them without full knowledge of what they mean, we agree to the presumptions of incompetence cast by government, which is essential to subject us to their rules of conduct, the laws of nations. And psychologically, when we agree to do something we don't really understand, we are under the control of another person's will, we breath life into their plans or agenda as pawns. The term that describes this is mind control, and is literally what it is. Furthermore, the people of the US were pledged as collateral on all public debt, due to the bankruptcy of 1933, so when we make a pledge to the United States, we are verbally acknowledging our status as subjects to the state, our status as debtors to the government. Within trust law, this is an admission of incompetence, and a declaration that we are wards of the state, unable to manage our affairs. Why? Because we never rebut the presumptions of our subject status, which are encoded within the legal framework of all nations. But none of these declarations, pledges or vows are valid, we don't really understand what we are making a pledge for, there is a lack of knowing, willing and intentional consent. We are not aware of the government's presumption that we are debt slaves, incompetent and beholding as subjects to the state. And this means that any solemn promise cannot be truly binding on the individual as it was based in fraud and made under duress. The truth is, most of us take the pledge of allegiance because, not to, would mean being socially outcasted by a teacher or our peers. This means the pledge isn't about a bonafide solemn promise made with knowledge, instead, it's comparable to being forced under gun point to make a vow, which again, is void. I would argue that the whole point of the pledge of allegiance, in its current form, is to develop a consciousness of false pride within the minds of the people so that the learn to love their enslavement, instead of seeking for reforms and true freedom. This is because we are told the nation stands for truth, justice and goodness, yet we lack the discernment as children to actually verify this claim. And to question these pillars of national pride would mean going against the quasi religious doctrine of a nation's self proclaimed status of benevolence. When faced with this choice, most of us would rather follow the status quo, but we can always make a new choice. The Bellamy salute is the salute described by Francis Bellamy, Christian socialist minister and author, to accompany the American Pledge of Allegiance, which he had authored. During the period when it was used with the Pledge of Allegiance, it was sometimes known as the "flag salute". Later, during the 1920s and 1930s, Italian fascists and Nazis adopted a salute which had the same form, and which was derived from the so-called Roman salute. This resulted in controversy over the use of the Bellamy salute in the United States. It was officially replaced by the hand-over-heart salute when Congress amended the Flag Code on December 22, 1942. The good news is, with knowledge comes power, if it is acted upon. In law, one of the most powerful things we can do is speak words into existence. A vow made without conscious consent is, at best, an attempt at coercing someone into doing something they otherwise wouldn't do; and at worst, is a meaningless fraud. But a statement made in truth, given life by knowledgeable consent is a powerful thing. It is the word made flesh, and it sends waves of causation out into the universe, which is essentially the power of affirmation. 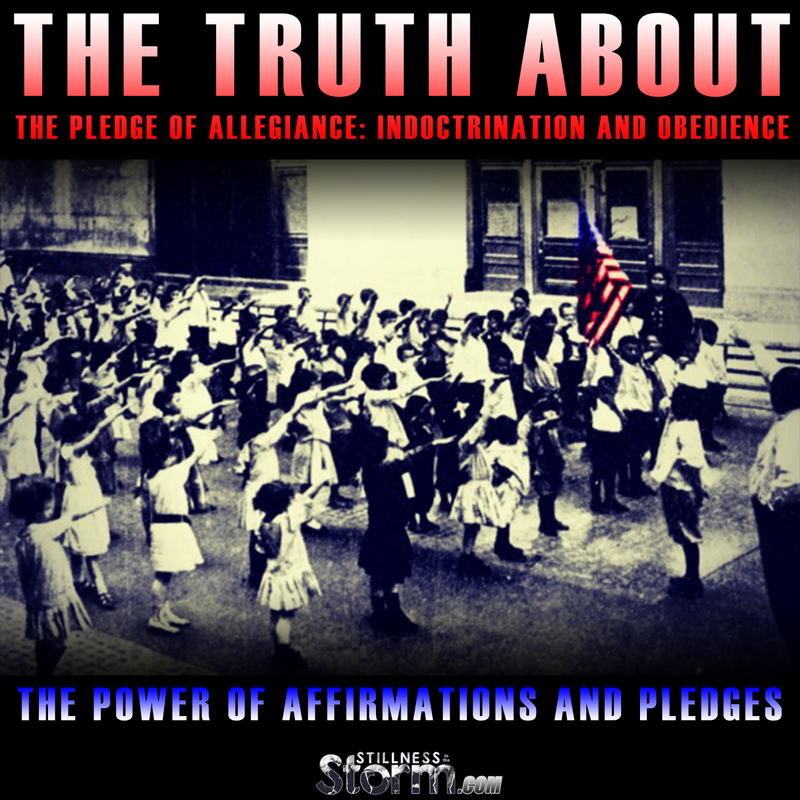 So with this knowledge of what the pledge of allegiance really is, an indoctrination tool, we can make a new pledge to truth, love and freedom. We can rescind all our past promises that were made under duress and make a new solemn vow to ourselves to honor the truth and walk with it for the betterment of all. 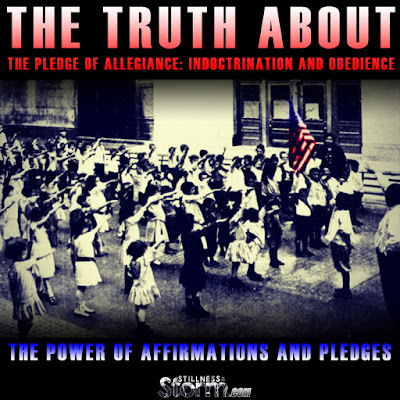 A look into the origins of the pledge of allegiance – mandatory regurgitation for school children – reveals that it was actually created by a magazine in 1892 in order to sell flags to schools, and the pledge was created by Francis Bellamy to create a reason for schools to buy the flags. In turn, this social ritual creates cohesion and unity in the mind of the public with the federal government. Until it was changed in the 1940s, the salute was actually a military salute wherein children then “hailed” the flag in a fashion very similar to what was done in Nazi Germany. American children were instead trained to put their hand over their hearts… and the phrase “under God” wasn’t added until 1954 in the Eisenhower Administration – controlled from the shadows by Secretary of State John Foster Dulles and his brother Allen. The 20th Century was the era of collectivism. During the same general time period that communism, fascism and national socialism swept over the land, America quietly transformed into a nation dominated by central government, and swarmed with agencies under the executive branch. In the midst of cities and technology, traditions of independence and self-reliance were replaced by collectivism – where the greater good took precedence over the needs and rights of the individual. Social Security and other programs put everyone on the State farm. Only with brainwashing can the many learn to love their servitude and give up their freedoms.